For those of you that have a bird watching bug in you this news will get you all excited, The Comb Duck known to be a very rare migrant to Sri Lanka was spotted by a water hole in the Yala National Park last week – outside its migrant season! The discovery was made by Naturalist Indika Nethigama of Leopard Safaris Camp in Yala while he was on safari with guests. A big thank you to Leopard Safaris for sharing this rare image with us. The Comb Duck (Sarkidiornis melanotos) which was a resident in the past but was declared extinct in Sri Lanka due to it being hunted in the colonial days, has been classified as a very rare migrant. 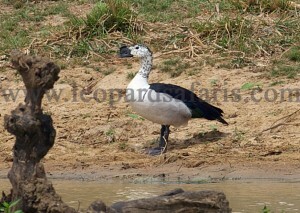 It is also one of the largest species of duck. The male is much larger than the female, and has a large black knob on the bill. The spotting of such a wonderful male specimen in late June might suggest that the bird might be resident in Sri Lanka after all. However I will leave it to the leading Ornithologist of the country to come up with the correct theory for this. One things for sure, you know where I will be heading to this weekend!